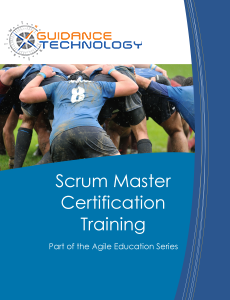 This two-day Scrum Master Training course covers the key components of Scrum and addresses the challenges of adopting an Agile project management approach. Scrum is one of the Agile frameworks that uses simple techniques increase productivity, delivery and quality. Scrum is an iterative, incremental framework for developing any product or managing any work. Scrum provides a framework which allows teams to deliver a potentially shippable set of functionality every iteration, providing the agility needed to respond to rapidly changing requirements. The Scrum framework constantly challenges its users to focus on improvement, and its Sprints provide the stability to address the ever-changing needs that occur in any project. These characteristics have led to Scrum becoming the most popular method in the world of agile software development.